The defensive corps of your team is one of the most important aspects (along with goaltending and the offensive portions). Because the defensive corps is traditionally 1/3rd of the skaters on the ice, and plays a larger percentage of the minutes, any weakness within your backend can quickly cause you to bleed in shot attempts, goals and losses. Those in team management need to be constantly evaluating their talent to find weaknesses where they can improve. This is especially important to do as people tend to remember players how they were and not how they are currently. The Ottawa Senators have not been a great team this last few years and the reason seems to be mainly that they are a budget team and are not able to spend like other teams combined with poor contractual decisions. What gets frustrating to fans is that the Senators will fight over a few hundred thousand dollars on some players (such as the Marc Method extension) while management is willing to open their arms and overpay players that do not equal their current talent levels (e.g. Chris Neil, Chris Phillips, David Legwand). So let’s see how the current Senators defence corps is performing this year and see where some of the biggest weaknesses are. To establish our baseline we select a few important statistics to help us measure the performance of players in the defence corps. We look at all defencemen in the league, who have played more than 300 minutes, and group them in 60s to establish which is the minimum output require to belong to that bin. All statistics are at 5 on 5 from stats.hockeyanalysis.com and the baseline is established below. Corsi-For per 60 minutes (CF/60) – The amount of shot attempts directed towards the opponents net, while this defencemen is on the ice, per 60 minutes of play. Corsi Percentage relative to Teammates (CF%relTM) – how the defencemen impacts the shot attempt percentages of his most common teammates. 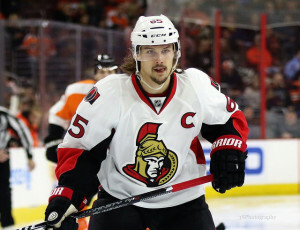 Erik Karlsson is no surprise a top pairing defensmen, he’s one of the best defencemen in the league. His biggest “flaw” is that he allows shot attempts against at a 2nd pairing rate. Marc Methot is another Senators defencemen that performs as a first pairing defencemen in nearly every facet. His biggest flaw is that his points/60 is that of a second-pairing defencemen and I would expect this to rate to drop given his on-ice PDO of 105.9%. Patrick Wiercioch will surprise most people who do not pay close attention to Senators analytics. He performs as well as a 1st pairing defencemen while his points per 60 is that of a third pairing defencemen, likely a result of the combination of the players he is often playing with, and with his own personal shooting percentage of 3.12%. It’s clear by the fact that he is often a healthy scratch, and that “eye test” analysts do not like his style of play, he does not receive the love he should be. Wiercioch should be played much more frequently and within the top 4 but will likely be sold for pennies on the dollar. The Ottawa Senators literally do not have a single defencemen, on their current roster, that performs at a second-pairing talent. The Senators have a number of regular defencemen in the bottom pairing. Cody Ceci is currently performing like a third pairing defencemen but he does have some second pairing upside in terms of his offensive ability. He only just turned 21 years old so he still has plenty of time to develop. 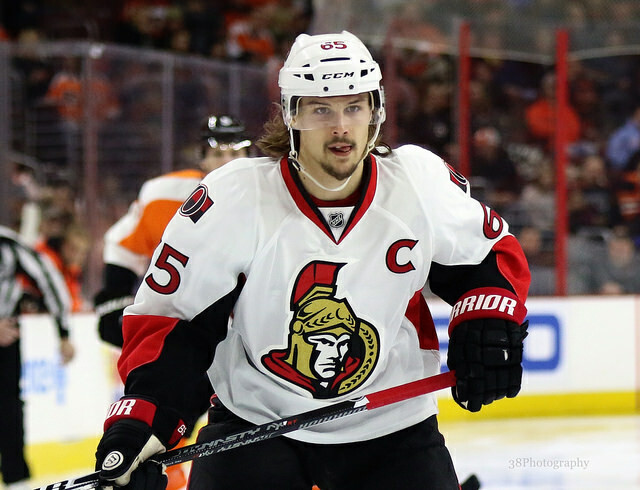 While it’s unlikely he will be Erik Karlsson 2.0, he still has the ability to improve. Mark Borowiecki and Eric Gryba are nearly identical. They perform in every way as third pairing defence while Borowiecki has some offensive upside but is likely a result of his higher on-ice PDO of 102.9%. For third pairing defencemen these two guys are not the worst choice. Jared Cowen is 24 years old and what you see is what you are going to receive from him. While the Senators drafted Cowen as 9th overall in 2009, they need to let that idea go as he is not performing any better than a 3rd pairing defencemen you can find off of free agency for a fraction of what they are paying him. His points per 60 are below replacement level but that is likely a result of his on-ice PDO of 96.9%. Chris Phillips is a player that the Senators should have walked away from years ago. At almost 37 years old he is well past his prime and currently performs equal to a replacement level player. In terms of increasing your winning probabilities Phillips does not deserve the 2nd pairing ice time that he is receiving. Thankfully this seems to have changed under Dave Cameron. There are a number of flaws within the defensive corps on this team. The biggest flaw is the abundance of third pairing (or worse) talent and lack of any second pairing talent combined with their unwillingness to play better talent over players with franchise history. Based on who they have in the line up the best possible defensive line up currently would be something like: Karlsson/Wiercioch, Methot/Ceci, and Borowiecki/Gryba. Bottom pairing defencemen, who have good underlying numbers, are not that difficult to find on free agency. If the Senators are willing to walk away from players like Cowen and Phillips, then they could easily make one or two cheap acquisitions that could bolster their back end. But as with all problems in Ottawa, until Melnyk is willing to open his wallet even the slightest so there is not much improvement the Senators can expect.